Frederick Douglass, born into slavery in 1818, escaped his slave master and became a writer, speaker, and public servant. He was beaten from child- into early adulthood by his slave master. After one beating too many, he decided he was never going to tolerate another. When the slave owner tried to beat him, Frederick ferociously fought back. By 1893, he was the leading black intellectual of his era, having penned many autobiographies detailing his life as a former slave. He put the lie to the argument slaves did not possess intelligence to lead their own lives with all the rights accorded to white citizens. What is little known about Douglass is his appointment as General Consul to the Republic of Haiti. During his assignment, he learned of the slave revolt. Spearheaded by Toussaint Louverture, it led to Haiti's liberation as the first black-led nation in the world. At the Chicago World's Fair in 1893, Douglass spoke about the slave revolt in Haiti and African-Americans' fight for liberation. He acknowledged American slaves' debt to Haiti, whose victory over slavery encouraged the abolitionist movement in America. His appearance was in connection with the Haitian Pavilion, whose construction he oversaw as a representative of the Haitian government. 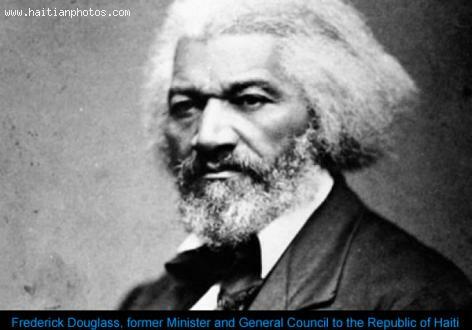 Frederick Douglass espoused causes of all kinds, from women's suffrage, to American Indian and immigrant rights. An example of what American blacks have come to achieve, his legacy shows Haiti she must accord equal rights to women and stop the practice of restavek, a form of modern-day slavery.